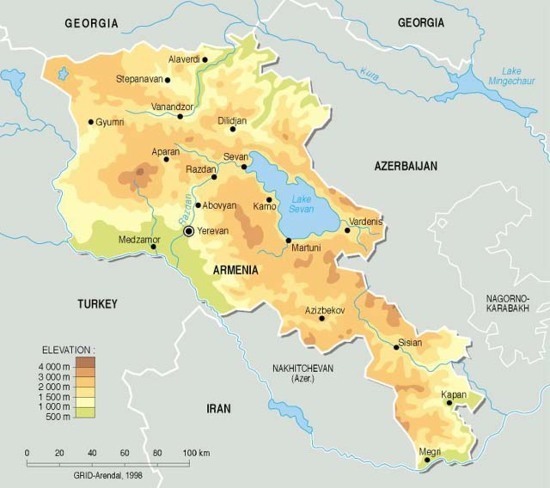 Armenia is located in Southwestern Asia, east of Turkey, comprising of 29,800 sq km. 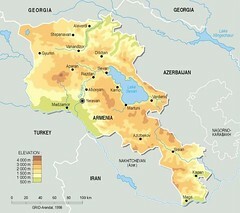 It has a population of 2,982,904 (2005). Major environmental concerns are: soil pollution from toxic chemicals such as DDT; the energy crisis of the 1990s led to deforestation when citizens scavenged for firewood; pollution of Hrazdan (Razdan) and Aras Rivers; the draining of Sevana Lich (Lake Sevan), a result of its use as a source for hydropower, threatens drinking water supplies; restart of Metsamor nuclear power plant in spite of its location in a seismically active zone.